Coral snake, or coralsnake, is the common name for often colorful venomous snakes belonging to several genera of the Elapidae family. Traditionally, six genera have been known collectively as coral snakes, the American coral snake genera Micrurus, Micruroides, and Leptomicrurus, and the Asian coral snake genera Calliphis, Sinomicrurus, and Hemibungarus (Castoe et al. 2007; Murphy). However, Castoe et al. (2007), based on molecular phylogenetic analyses and descriptive morphological evidence, suggest that "Hemibungarus is not (phylogenetically) a coralsnake," but the other five genera do form a clade. In particular, the name coral snake is associated as a common name with species belonging to Micrurus (American coral snakes or American coralsnakes), Micruroides (Western coral snakes or Sonoran coralsnakes), and Leptomicrurus (thread coral snakes) (ITIS 2004a,b; Myers et al. 2008). Despite its potent venom, coral snakes are not aggressive toward humans and bites are rare, usually accidental in nature or because of aggression on the part of humans. Their often brilliant colors add to the wonder of nature, but can also pose an attraction to children. Coral snakes do play an important ecological role in food chains, preying upon small vertebrates (other reptiles, lizards, amphibians, small mammals, young birds) as well as insects, and being preyed upon by some birds of prey, some mammals, and other snakes. As part of the Elapidae family of snakes, coral snakes are characterized by hollow, permanently erect, relatively short fangs in the front of the mouth that channel venom into the prey. Elapids are a diverse group of more than 300 species placed in about 60 genera (Keogh 2004). Coral snakes comprise about one-third of the alpha diversity of the Elapidae family (Castoe et al. 2007). These snakes can be divided into two distinct groups, New World coral snakes and Old World coral snakes. The three genera of New World coral snakes (Micrurus, Micruroides, and Leptomicrurus) consist of over 65 recognized species (ITIS 2004a, 2004b, 2005a). The Old World coral snake genera (Calliphis, Sinomicrurus, and Hemibungarus) comprise about 14 species (ITIS 2004c, 2004d, 2005b). Slowinski et al. (2001), based on morphological and molecular (mtDNA) characters, conclude that Micrurus and Micruroides are needed along with the Asian coral snakes to make a monophyletic group. Castoe et al. (2007), using molecular phylogenetic analyses and comparison of external morphological and hemipenial characters, suggest that that only five genera of the Asian and American coral snakes form an exclusive clade, these being Calliophis, Sinomicrurus, Micruroides, Micrurus, and Leptomicrurus. They suggest a new classification for the coral snakes called Calliohini, consisting of these five genera. Hemibungarus, as represented by by the "enigmatic Asian coralsnake" H. calligaster, was determined not to be a coral snake and was placed outside this clade. In general, coral snakes tend to be brightly colored and have small heads, or with strongly contrasting patterns that can warm predators of their venomous nature (Castoe et al. 2007; Murphy). Old World coral snakes tend to have 13 or 15 rows of scales at mid body, while New World coral snakes have 15 or 17 rows of scales at mid body (Murphy). Most species of coral snake are small in size. North American species average around 90 centimeters (three feet) in length, but specimens of up to 150 centimeters (five feet) or slightly larger have been reported. Aquatic species have flattened tails, to act as a fin, aiding in swimming. Coral snakes in North America (Micrurus fulvius, Micrurus tener, and Micruroides euryxantus) are most notable for their red, yellow/white, and black colored banding. Several nonvenomous species have similar coloration, however, including the scarlet kingsnake, the scarlet snake, and the milk snake. 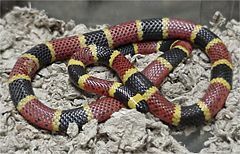 In some regions, the order of the bands distinguishes between the non-venomous mimics and the venomous coral snakes, inspiring some folk rhymes: "If red touches yellow, it can kill a fellow" (coral snake) and "if red touches black, it is a friend of jack" or "red and yellow, kill a fellow; red and black, venom lack." However, this only reliably applies to coral snakes in North America, found in the southern and eastern United States. Coral snakes found in other parts of the world can have distinctly different patterns, and can even have red bands touching black bands, have only pink and blue banding, or have no banding at all. Coral snakes vary widely in their behavior, but most are very elusive, fossorial snakes, which spend the vast majority of their time buried in the ground or in leaf litter of a rainforest floor, only coming to the surface during rains or during breeding season. Some species, like Micrurus surinamensis, are almost entirely aquatic and spend most of their lives in slow moving bodies of water that have dense vegetation. Some are climbing. Like all elapid snakes, coral snakes use a pair of small fangs, which are fixed in the front of their top jaw, to deliver their venom. Due to the time it takes for the venom to take effect, coral snakes have a tendency to hold on to a victim when biting, unlike vipers, which have retractable fangs and tend to prefer to strike and let go immediately. Coral snakes are not aggressive or prone to biting however, and account for less than one percent of the number of snake bites each year in the United States. Most coral snake bites occur because of accidental handling of the snake while engaged in an activity like gardening. When disturbed, coral snakes tend to thrash their tails and bodies from side to side, flatten and coil their tails, and hide their head under the body coil (Murphy). Coral snakes possess the second most potent venom of any North American snake, behind some rattlesnake species. However, few bites are recorded due to their reclusive nature and the fact they generally inhabit sparsely populated areas. When confronted by humans, coral snakes will almost always attempt to flee and will bite only as a last resort. In addition, coral snakes have short fangs that cannot penetrate thick shoe leather. Any bite however, is a medical emergency that requires immediate attention. Coral snakes have a powerful neurotoxin that paralyzes the breathing muscles; mechanical or artificial respiration, along with large doses of antivenom, are often required to save a victim's life. There is usually only mild pain associated with a bite, but breathing difficulties and ptosis can occur within hours. Allen's Coral Snake, Micrurus alleni—eastern Nicaragua, Costa Rica, and Panama. Annellated Coral Snake, Micrurus annellatus—southeastern Ecuador, eastern Peru, Bolivia, and western Brazil. Bogert's Coral Snake, Micrurus bogerti (Roze, 1967)—Oaxaca. Brown's Coral Snake, Micrurus browni - Quintana Roo to Honduras. Catamayo Coral Snake, Micrurus catamayensis (Roze, 1989)—Catamayo Valley of Ecuador. Southern Coral Snake, Micrurus frontalis—Brazil to northeastern Argentina. South American Coral Snake, Micrurus lemniscatus—most of low lying areas of South America. Castoe, T.A., E.N. Smith, R.M. Brown, and C.L. Parkinson. 2007. Higher-level phylogeny of Asian and American coralsnakes, their placement within the Elapidae (Squamata), and the systematic affinities of the enigmatic Asian coralsnake Hemibungarus calligaster. Zoological Journal of the Linnean Society 151(4): 809-831. Integrated Taxonomic Information System (ITIS). 2004a. Micrurus Wagler, 1824. Taxonomic Serial No. : 174353. Retrieved July 31, 2008. Integrated Taxonomic Information System (ITIS). 2004b. Micruroides Schmidt, 1928. Taxonomic Serial No. : 174351. Retrieved July 31, 2008. Integrated Taxonomic Information System (ITIS). 2004c. Calliophis Gray, 1834. Taxonomic Serial No. : 700209. Retrieved July 31, 2008. Integrated Taxonomic Information System (ITIS). 2004d. Hemibungarus Peters, 1862. Taxonomic Serial No. : 700223. Retrieved July 31, 2008. Integrated Taxonomic Information System (ITIS). 2005a. Leptomicrurus Schmidt, 1937. Taxonomic Serial No. : 700295. Retrieved July 31, 2008. Integrated Taxonomic Information System (ITIS). 2005b. Sinomicrurus Slowinski et al., 2001. Taxonomic Serial No. : 700254. Retrieved July 31, 2008. Keogh, J.S. 2004. Elapidae. In B. Grzimek, D. G. Kleiman, V. Geist, and M. C. McDade (eds. ), Grzimek's Animal Life Encyclopedia. Detroit: Thomson-Gale. ISBN 0787657883. Lavin-Murciol, P. A., and J. R. Dixon. 2004. A new species of coral snake (Serpentes, Elapidae) from the Sierra de Tamaulipas, Mexico. Phyllomeduso 3(1 ): 3-7. Retrieved December 8, 2008. Murphy, J.C. n.d. Squamata, Serpentes: Elapidae, genus Micrurus, etc.- coral snakes. JCM NAtural History Photography. Retrieved July 31, 2008. Myers, P., R. Espinosa, C. S. Parr, T. Jones, G.S. Hammond, and T.A. Dewey. 2008. Genus Leptomicrurus. Animal Diversity Web (online). Retrieved July 31, 2008. Slowinski, J. B., J. Boundy, and R. Lawson. 2001. The phylogenetic relationships of Asian coral snakes (Elapidae: Calliophis and Maticora) based on morphological and molecular characters. Herpetologica 57: 233-245. Uetz, P. 2007. Micrurus collaris Schlegel, 1837. The Reptile Database. Retrieved July 31, 2008. This page was last modified on 10 December 2008, at 21:44.